Gardiner Comfort, José Joaquín Perez, Ed Setrakian, and Shawn Randall in Fish Men. Photo by Carol Rosegg. BOTTOM LINE: The stakes are high in this game of chess. I've often wondered about the men who play chess in the park. What are their stories? How did they get so into the game? 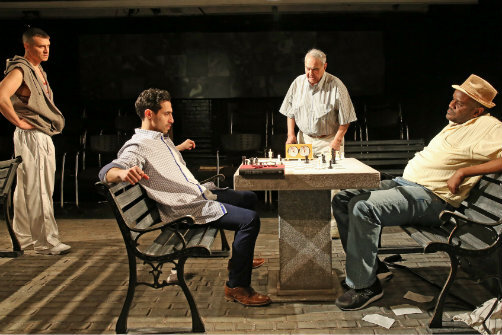 Playwright Cándido Tirado must have thought about this too because his play, Fish Men, answers those questions, at least about some fictional chess players that congregate at the Washington Square Park chess tables. Chess is an intense game already, and Tirado raises the stakes even higher: chess saved the life of each of these men. I don't want to give away too much, because part of what keeps the play interesting is learning more about their pasts as they play the game. On this particular day in the park, Rey (José Joaquín Pérez) stops by to pay back the debt his uncle accrued the day before losing at chess. The man he owes is not there, but Cash (Shawn Randall) and John (Gardiner Comfort) entice Rey to play while he waits. Jerome (David Anzuelo) and Ninety-Two (Ed Setrakian) try to persuade Rey to just play at Jerome's table for fun (Jerome doesn't play for money like the other hustlers). When Rey enters the park, we hear him on the phone to his girlfriend, saying that he is going to get revenge against the men who took advantage of his uncle. This scene means we know where the play is going from the beginning, when instead we should constantly be guessing as to who is playing who. For this reason, the final scene before intermission does not have the impact it could. There is still some intrigue, as we can't guess all the turns Fish Men takes, and the second act moves at an exciting pace (much quicker than the first, which could be trimmed, as some of the dialogue gets repetitive). Director Lou Moreno and set designer Raul Abrego increase our level of investment by making us feel like we're in the park, with benches going into the audience. Tirado packs a lot into this play because his characters have dealt with some of the greatest atrocities in the world. Cash is African-American, John is Belarusian, Jerome is Native American, Ninety-Two is a Holocaust survivor, and Rey survived the civil war in Guatemala. Each one of their histories could be a play unto itself, and it occasionally feels like Tirado is tackling too much. But it's always refreshing to see diversity onstage and their stories are moving, especially as played by these actors. You feel for every one of them. They were still tripping over their lines (there are a lot of them) at the press performance I attended, but each actor is believable in his role, so it was easy to overlook. Fish Men is by Cándido Tirado. Directed by Lou Moreno. Scenic Design is by Raul Abrego. Lighting Design is by Christopher J. Cancel-Pomales. Sound Design is by Jesse Mandapat. Costume Design is by Meghan E. Healey. Production Stage Manager is Fran Acuña-Almiron. Assistant Stage Manager is Alejandro Maldonado-Morales. The cast is Shawn Randall, Gardiner Comfort, David Anzuelo, Ed Setrakian, and José Joaquín Pérez.